It was initially Slash's entry for the 2014 7DRL Challenge, but it has seen a lot of development since then. Ananias is a dungeon adventure game in which you explore an ancient ruins complex fighting its monstrous inhabitants and trying to survive to the bottom level, where you may find an ancient artifact to save the world.Every time you play the game will create a new dungeon full of challenges and surprises for you in 5 different environments populated with monsters and ancient magical artifacts. There are eight different player classes, each one designed with an unique play style. Some of them are combat focused while others must rely on the items found on the dungeon to survive. As you advance through the game, you will find more than 40 different monsters with distinct skills and features, you will be able to charm them using magic spells and make them follow you in your quest; using ancient magic found in the dungeon you will also unlock the powers and skills hidden on their evolved forms. 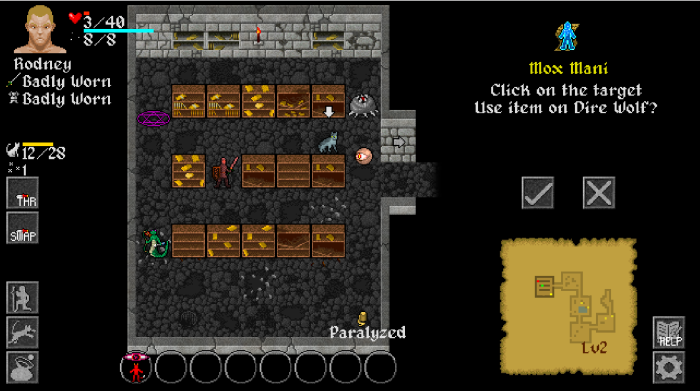 Unlike classic roguelikes adapted to modern media, in Ananias there is no cumbersome movement or complex commands, however all the features from the genre that make the games fun are kept: turn based combat, random level generation and long term item strategy are among the things that make every adventure into the dungeon enjoyable. You can also play along with your friends in the online mode; the game keep all friends up to date with their adventures in real time, so you can set up challenges or just have fun seeing your friend's characters die in the dungeon. The fellowship edition allows access to the four extra classes: Barbarian, Slayer, Monk and Sage. This page was last modified on 14 January 2018, at 01:20. This page has been accessed 52,506 times.